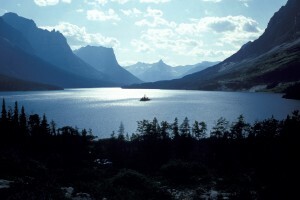 Boating in one of Glacier National Park’s beautiful lakes or rivers is a wonderful way to explore the area. Running clean, clear and cold, its pristine glacier-sculpted lakes and rivers will provide you with stunning views and unforgettable memories! Boat ramps are located on St. Mary and Two Medicine Lakes in the national park’s east side, or on the west side on Bowman and McDonald Lakes. The park also has many smaller lakes that are ideal for canoeing. If you’re looking to rent a boat during your Montana vacation, head to Many Glacier, Apgar, Lake McDonald Lodge, Rising Sun or Two Medicine Lakes. Rafting is another exhilarating way to get to know Glacier’s waters. The Flathead River in the southwest part of the park has great whitewater rafting in the late spring and early summer. The waters slow down, but are still fun for float trips later in the season. Use common sense! These are all general guidelines, but specific environmental situations should be considered. Safety first! -When approaching other vessels in Glacier head-on, stay to the right. -Motorboats must stay clear of vessels propelled by oars, paddles or sails. -Yield to vessels on your right in crossing situations. It is your responsibility to know and obey the U.S. Coast Guard and State of Montana regulations for boat operation and safety. Park rangers may inspect or board any boat for the purpose of examining documents, licenses, and/or other permits relating to the operation of the boat and to inspect the boat to determine compliance with regulations. For more National Park Service boating regulations, read the Code of Federal Regulations (Title 36, Part 3), available online, at park headquarters or at staffed ranger stations. Anyone planning to enter Glacier National Park’s waters should be aware that the rivers and lakes are freezing cold all year. Be forewarned that there is a serious risk of hypothermia year round. Canoes and other small, human-propelled watercraft don’t require registration, but all sail and motor boats 12 feet or longer must be numbered and registered according to State of Montana regulations. Other exemptions include some boats from other states or countries that wish to boat in Montana waters on a temporary basis. Human-propelled vessels (canoes, kayaks, etc. ): permitted on all Glacier National Park water bodies, except a section of Upper McDonald Creek. This area of Upper McDonald Creek between Mineral Creek and Lake McDonald is closed to all watercraft for the protection of nesting Harlequin ducks. Private motorboats: permitted in Lake McDonald, Bowman Lake, Sherburne Lake, St. Mary Lake, Two Medicine Lake, and the Waterton Lakes. Note: there aren’t any boat ramps on Sherburne Lake, only hand carried motor vessels are allowed. Also, only motorboats of ten horsepower or less are allowed on Bowman and Two Medicine Lakes. Check for signage and/or marker bouys for closures. Boating may be restricted at any time, in any area for the safety or protection of sensitive wildlife habitat. Boating is not allowed on certain segments of the south shoreline of Lake McDonald with any motorized watercraft for the safety of the general public using the beaches for swimming. Motorized watercraft are prohibited within an area extending into the water 300 feet perpendicular to the shoreline. Additional prohibited sections are: from the outlet of the lake, extending eastward about 60 yards west of the existing concession boat dock facility and from the Apgar Amphitheater eastward to where the shoreline meets Going-to-the-Sun Road. -Personal flotation devices (Type I, II, III or V). Everyone on board must have one! Throwable (Type IV) flotation devices like cushions are no longer acceptable as substitutes. -A USCG approved flame arrestor must be on each carburetor on inboard gas engines. -Fire extinguishers (Type B-1) or a fixed fire extinguisher system for all outboard engines with enclosed fuel compartments. -A horn or other sound-producing device is required for motorboats that are 16 feet or longer. -Navigations lights. Required for motorboats and sailboat used between sunset and sunrise. -Reckless or negligent boat handling that endangers or is likely to endanger the lives of others. -Boat handling by anyone under the influence of drugs or alcohol. -Installation of any obstruction in the water. -Operating a vessel in excess of 5 mph within 100 feet of a diver’s marker, a downed skiers or a swimmer. -Throwing trash, toilet waste or debris of any kind into the water. -Riding on transom, funwales or foredeck while the boat is going more than 5 mph. -Swimming from the boat while the boat is moving. -Interference with other vessels or with proper and free waterway navigation. -Leaving the boat unattended for more than 24 hours without authority from the superintendent or his/her authorized representative. -Using trailers to recover or launch vessels anywhere other than at a designated boat launch. You must find a Glacier National Park ranger to report any boating accident which has resulted in property damage, personal injury or death within 24 hours of the incident. At the time of the accident, you must supply the boat operator’s name and address, along with the identification information for the boat in writing to any person injured or to the owner of any property damaged. Also, in general, boaters should help anyone who needs it while in park waters. Water skiing is permitted only on Lake McDonald and St. Mary Lake from sunrise to sunset. To ski, you must have at least two people in the boat while someone is skiing (one to drive and one to constantly watch the skier). Each person must have a USCG approved lifesaving device (a life jacket). Ski belts are no longer acceptable. Towing skiers is prohibited within 100 feet of any person swimming or diving. Federal regulation bans the use of any watercraft that exceeds 82 decibels of sound within Glacier National Park. Check your engine’s decibel levels if you are operating a high-powered vessel to make sure it is in compliance. Strictly enforced!